FEATURES: Each stamp on this page has a 3/4" thick hourglass-shaped & varnished wood handle for comfort, foam cushion of 1/8", closely trimmed red rubber and is indexed in black ink. Note: The sizes below refer to the size of the wood mount, the actual rubber is about 10% smaller. The two stamps on the left work well together. They are often shown on wedding cards and represent the Ying & Yang in Chinese cosmology. 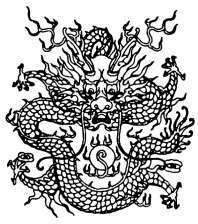 The Phoenix (Ying) represents grace and virtue, while the Dragon (Yang) symbolizes rule and authority. Placed together, they are signs of a well-balanced marriage. Why is this man riding a dragon? Chinese dragons had traditionally been used on clothing & paintings only by the emperor or very high-ranking government officials to symbolize power. A person able to tame and ride a dragon must be powerful indeed!